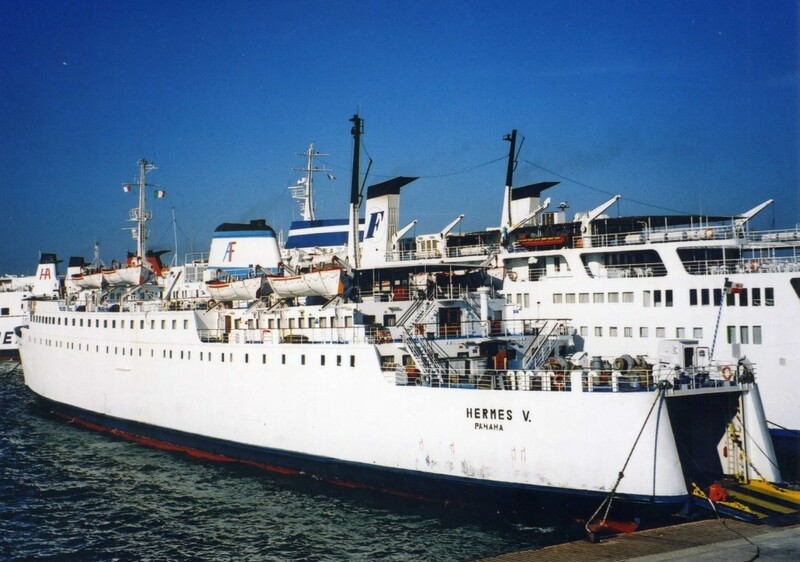 Hellenic Mediterranean Lines were probably the most famous Greek ferry company, well-known initially for fairly exotic liner service and latterly for decades of transporting backpackers on Inter-rail tickets from Italy to Greece. 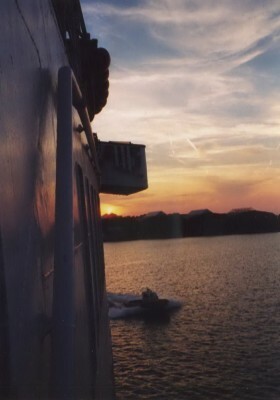 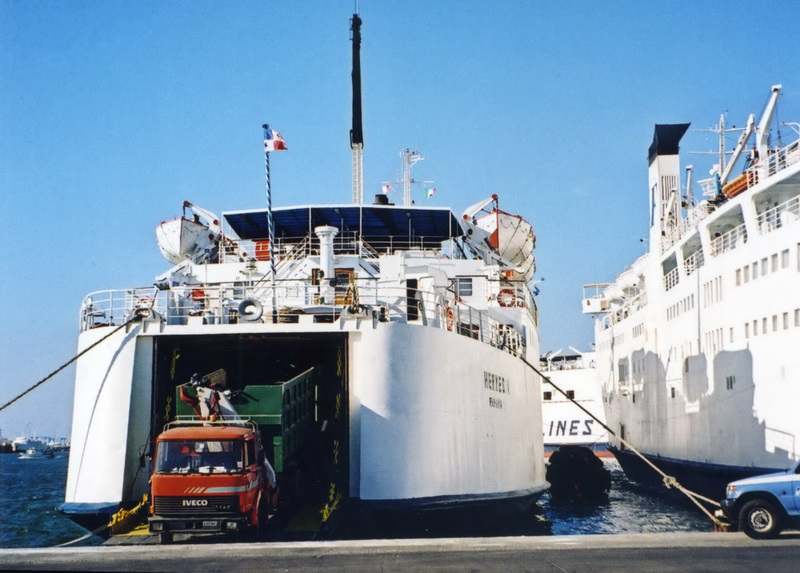 By the early 1990s, HML was operating a grand fleet of veteran car ferries, but their early entries into this market were more impressive, taking delivery of the brand-new Egnatia in 1960, the Adriatic’s first purpose-built overnight car ferry. Then, in the 1970s, they ordered two exceptional new ships, the car ferry Castalia and the pure cruise ship Aquarius. 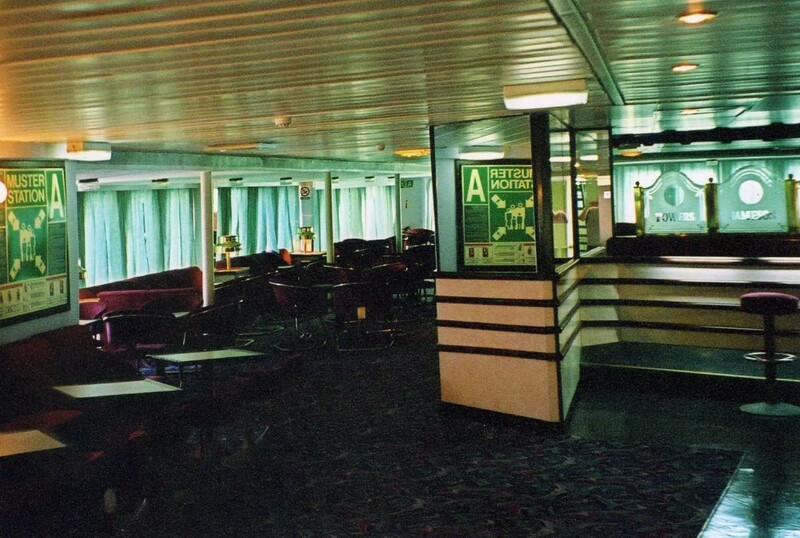 The future seemed secure but this was to be high water mark for the company and, although the fleet expanded through the 1980s, the market changed and they failed to follow it. 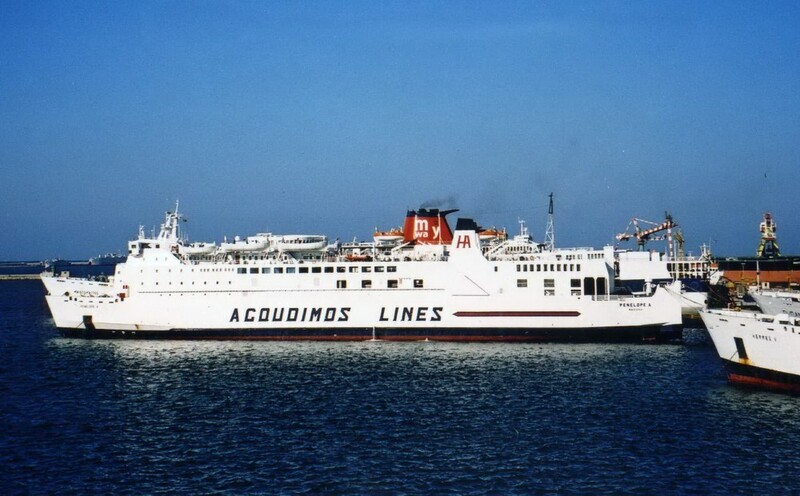 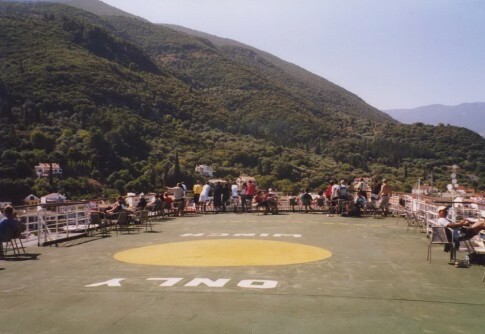 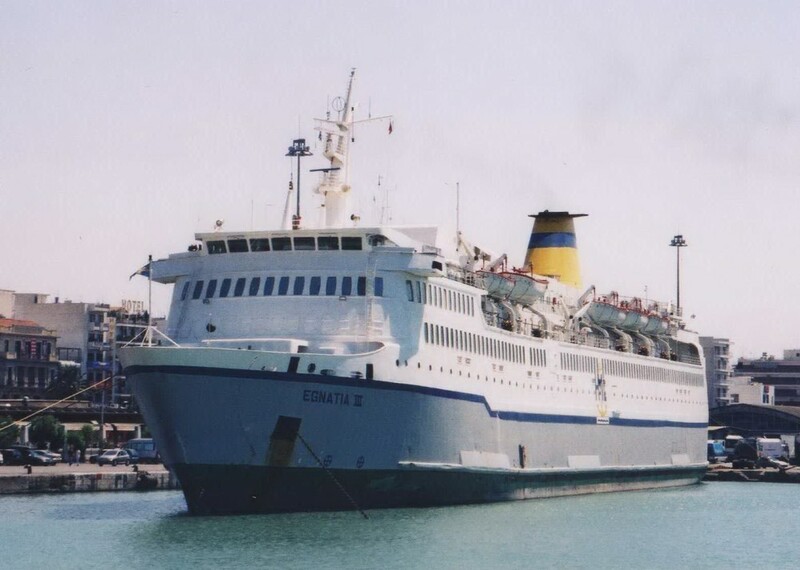 By 2003, the company was reduced to just two ferries – the Egnatia III and the veteran Poseidonia. 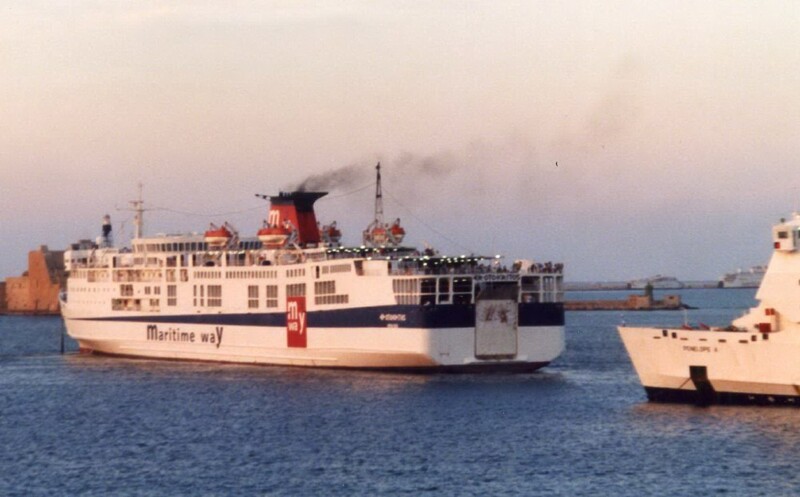 The latter, once the Belfast Steamship Company’s (later P&O Ferries’) Ulster Queen was by then far too small, chronically outdated and much too slow. 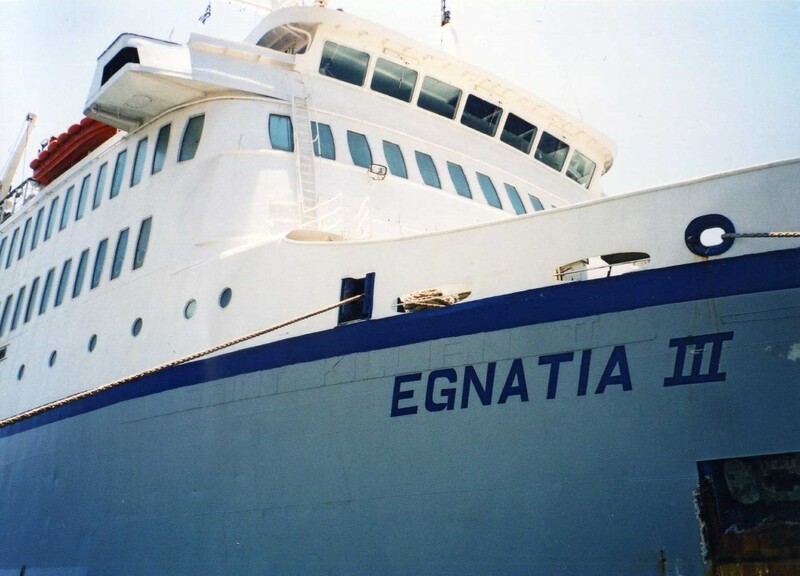 The Egnatia III, although built only six years later, in 1973, was another matter entirely. 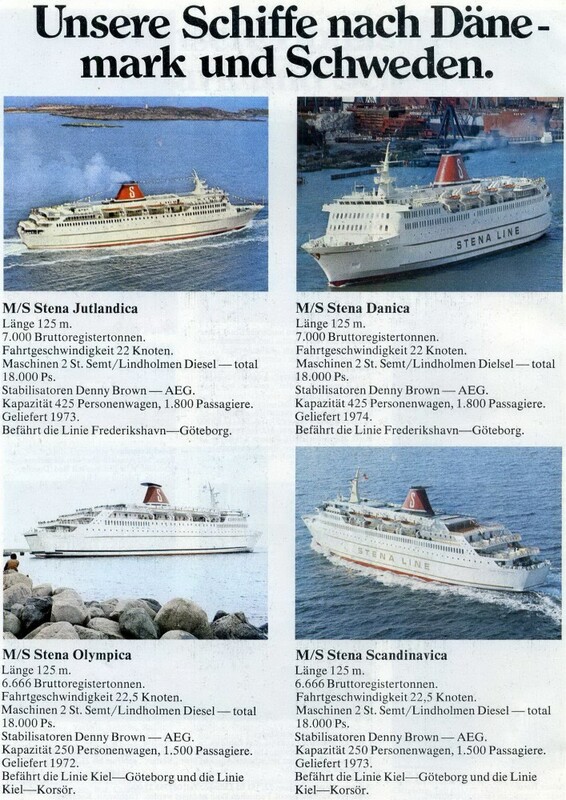 Originally the Stena Scandinavica she was one of Stena’s famous four from Yugoslavia, where Sten Olsson, by repute looking to build a pair of vessels, found he could get them built for half the price of a North European yard. 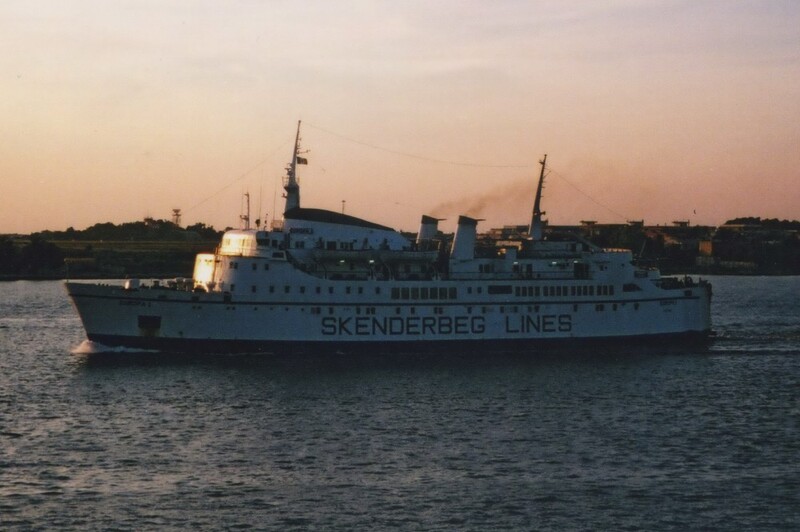 So he ordered four instead – two for the Gothenburg-Frederikshavn route (ships which later became the Bluenose and the Versailles/Seafrance Monet) and two for Gothenburg-Kiel (later the Scotia Prince and Irish Continental Lines’ Saint Killian II). 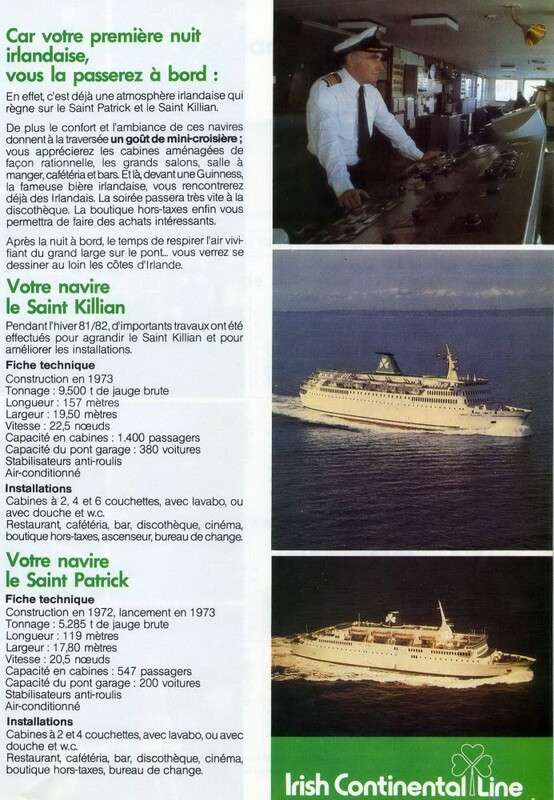 It was the Saint Killian II, lengthened by 30m in 1981, which finally found its way to HML, her Irish career drawing to a close after her owners rejuvenated their French operations with the acquisition of the Normandy in 1998. The ship spent almost five years laid up in a deteriorating state before HML revived her and introduced her on the classic backpacker route from Brindisi to Patras via Igoumenitsa, and, on some crossings, Corfu, Kefalonia, Paxos and Zakynthos. 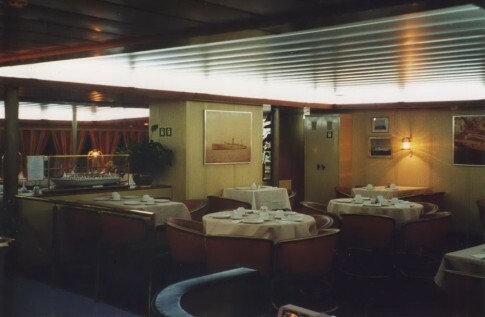 A view of the ship after her lengthening in 1981. 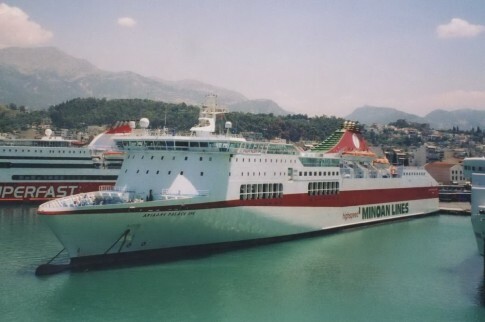 HML’s new, and final, flagship operated for the company for just one season, the summer of 2003, and I joined her for a sailing in July of that year which left Brindisi at 8pm and, after calls at Igoumenitsa and Kefalonia made it to Patras at 1.30pm the following day. We arrived in Brindisi on the high speed train from Ortona and, having wandered down the Corso Roma to the harbour, were faced across the harbour with the magnificent sight of the Derin Deniz, once B&I’s Innisfallen, which was in her final role sailing to Turkey. 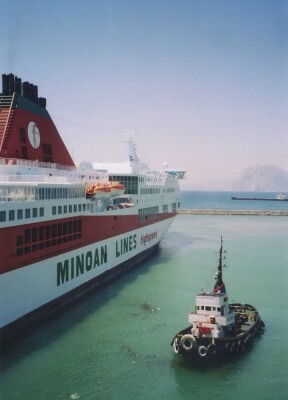 The Derin Deniz was not alone in port: whilst in the summer of 2013, only a couple of operators could be found running from Brindisi, on the day of our sailing aboard the Egnatia III twelve ferries were scattered around the port – ten of which were in service, each representing a different ferry line. Only one of those ten operators exists any more, and even they, Agoudimos Lines, are nearing the end. 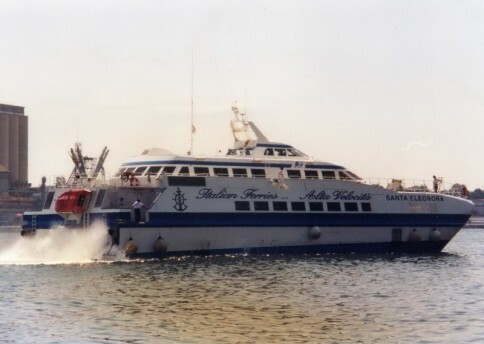 All but one of the twelve ships has been scrapped, the sole exception being the fast passenger ferry Santa Eleonora, today the Ponza Jet. 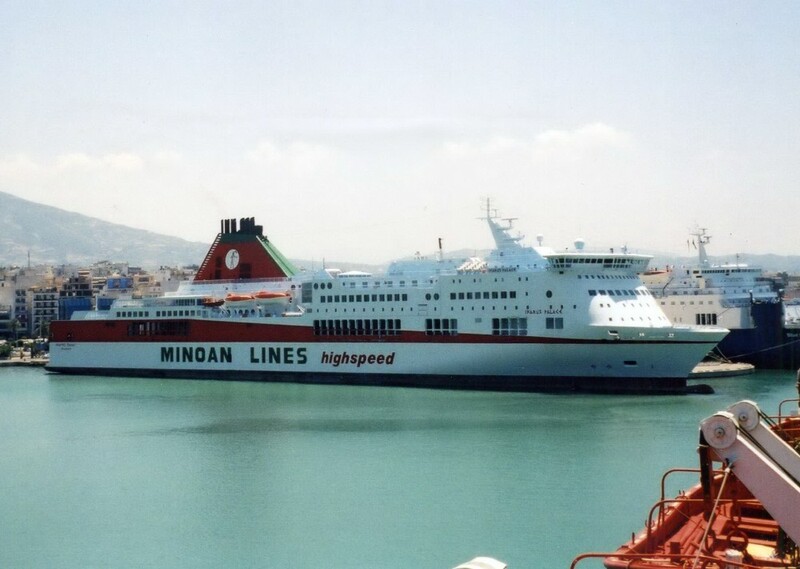 Just as depressing as that ferry roll of doom is the decline of the port of Brindisi – once one of the key hubs of the Adriatic ferry market it is today a peripheral, half-forgotten player. 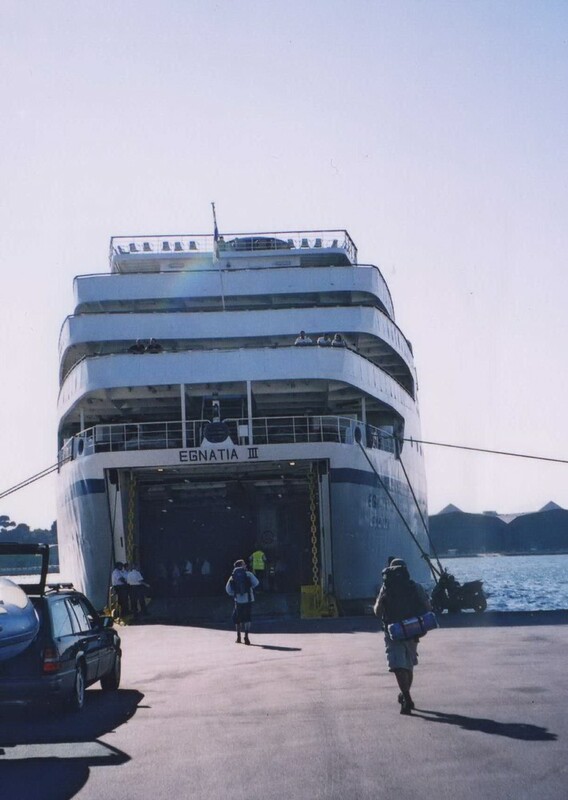 The Santa Eleonora arriving from Greece. 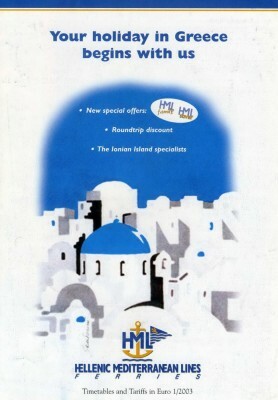 HML finally succumbed just a year later – the superficial promise of the 2003 season was followed by a quite disastrous 2004. 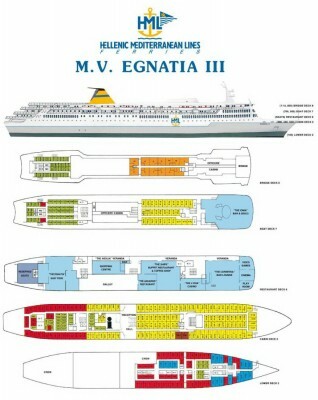 The Egnatia III was chartered out to Algeria Ferries but core operations back at home, which were to have been left in the hands of the Poseidonia, never properly materialised. 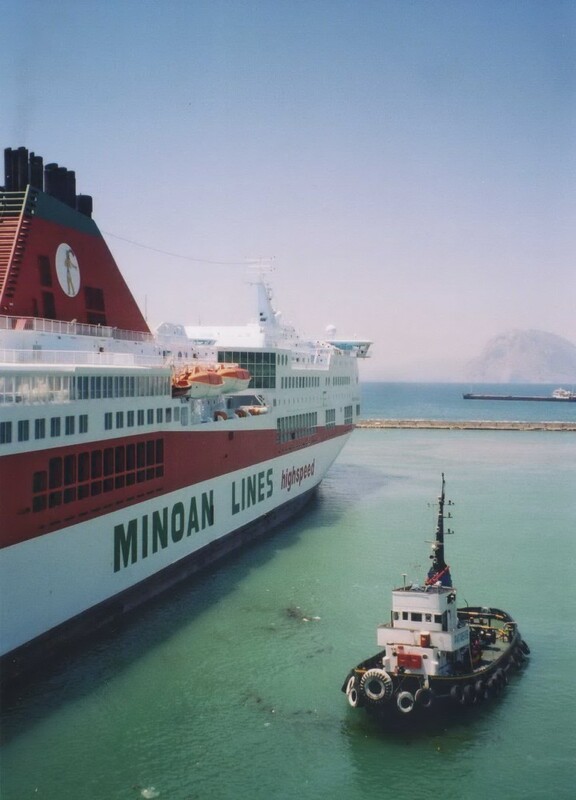 The little ship stayed alongside in Keratsini through the summer, with a last-minute charter of the old Japanese ferry Arielle being organised instead, giving that vessel the somewhat unlikely honour of operating HML’s last sailings. 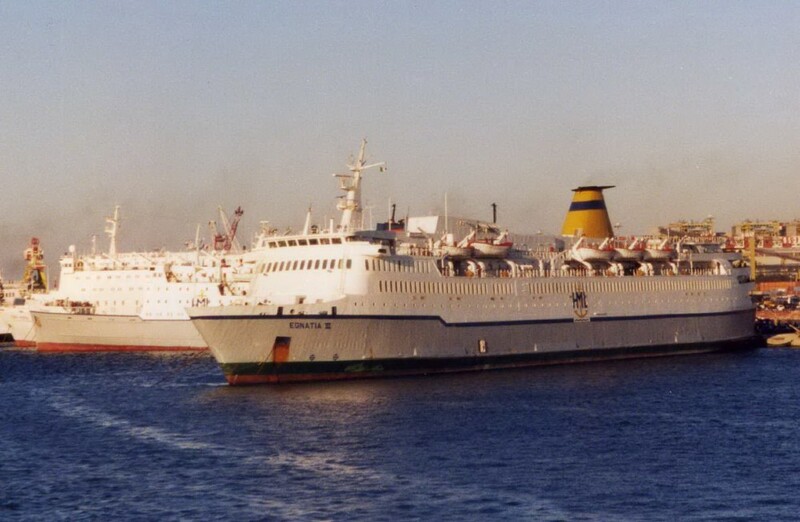 The Poseidonia, sold to Saudi Arabian interests, soon found herself sunk near Sharm el-Sheikh. The Egnatia III lay at anchor in Elefsis bay for a couple of years but was finally scrapped in India in 2007, bringing to an ignominious close the story of Greece’s most famous coastal shipping operator. The company’s old website persisted for many years and a version still does, now appropriated by a ferry booking engine but still with images of the Egnatia III. So well known was the HML name that the company’s Italian agent later licensed its use on brochures of operators such as GA Ferries and Endeavor Lines. 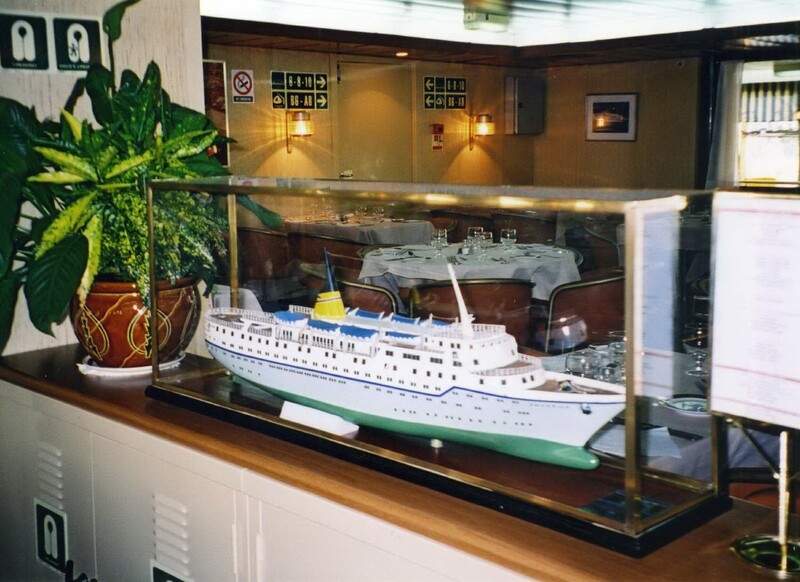 To this day, a giant builder’s model of the original Egnatia can be found in the window of their offices on the Corso Roma. 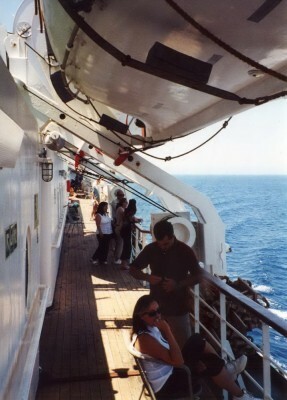 A decade after our sailing, I found myself flicking through the many pictures taken on that trip and share them below. 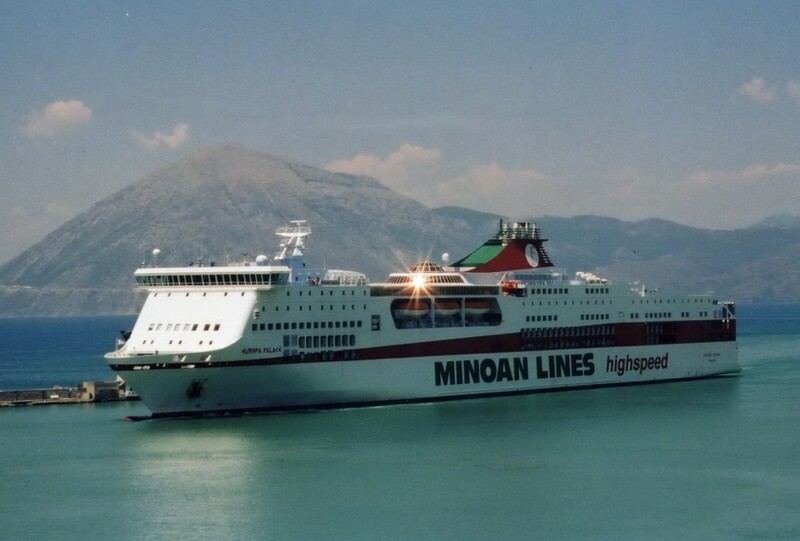 They aren’t quite of the standard I’d expect to take today, but they capture the final, optimistic but ultimately damned flourish of the great Hellenic Mediterranean Lines and are witness to the closing days an entirely lost era of ferry travel. 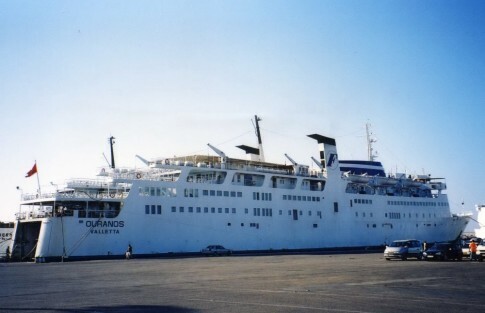 Walking over to our ship at Brindisi's Costa Morena port, we passed by Fragline's Ouranos (ex-Tor Hollandia of 1967). She was finally scrapped in 2010. 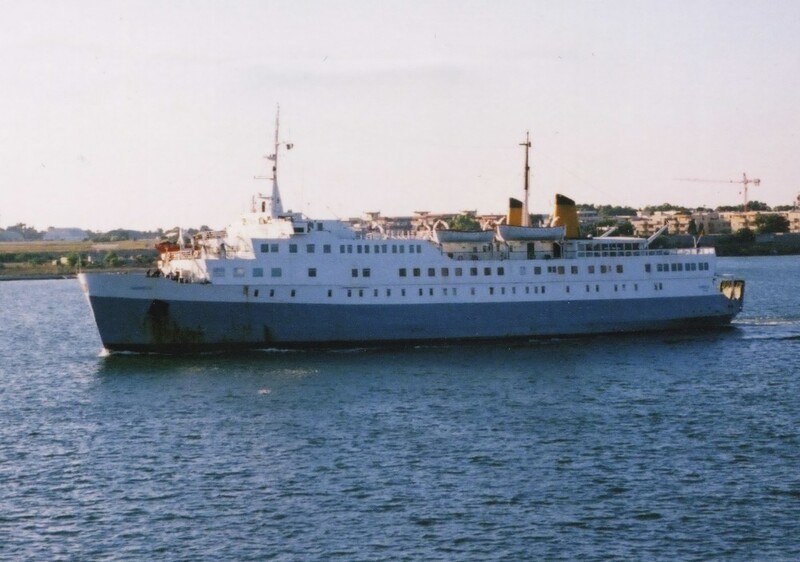 Employed by Access Ferries in sailings to Turkey was the Hermes V. Originally TT Lines' second Nils Holgersson of 1967, she was sold for scrap just one month after this picture was taken. 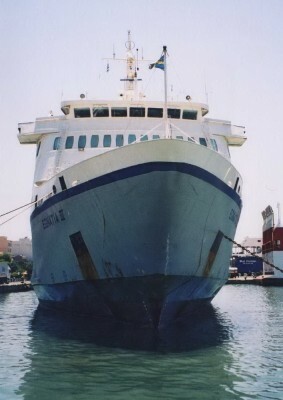 The Egnatia II at Brindisi later on in July 2003 with the little Poseidonia beyond. 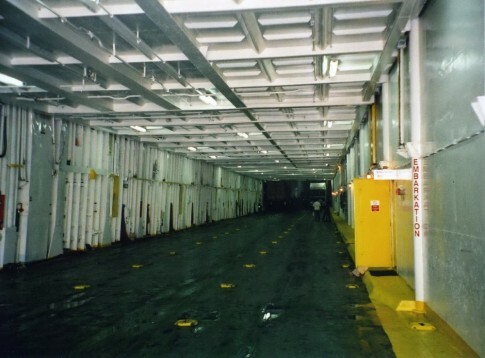 The main lobby on Deck 5, the primary cabin deck. 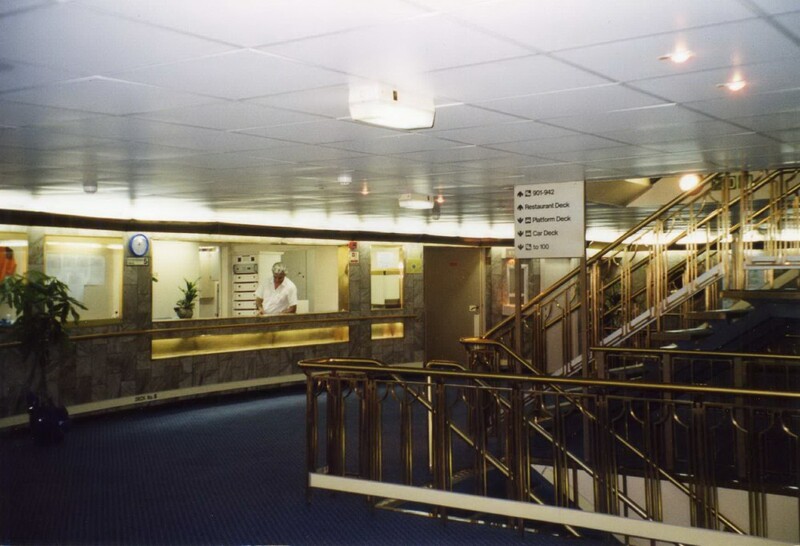 This outstanding space retained its original marble-fronted reception desk and ornate staircase balustrades. Another view, from the starboard side, showing more of the main staircase. 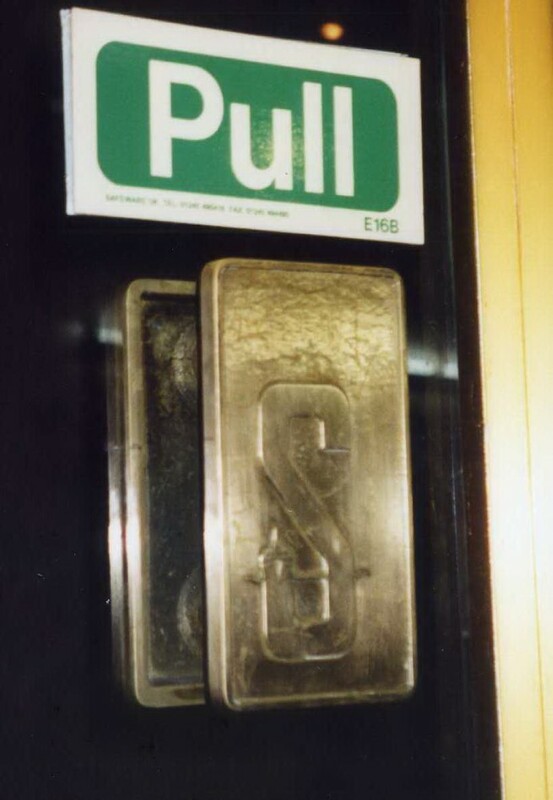 The doors to the telephone booths in the lobby retained their embossed Stena 'S's. 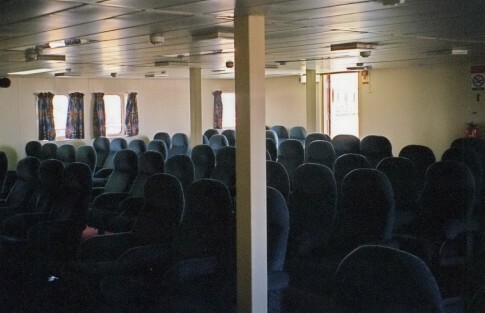 Moving up to Deck 6, right aft we find a forgettable reclining seat lounge. 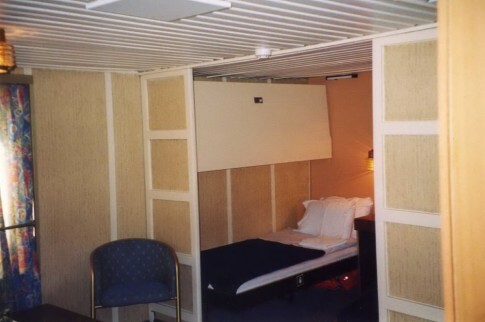 This was originally an area of cabins. Moving forward, this is the self-service restaurant, structurally little changed from its original incarnation. Here is the long port-side arcade which passed by the shop and the main restaurant areas. 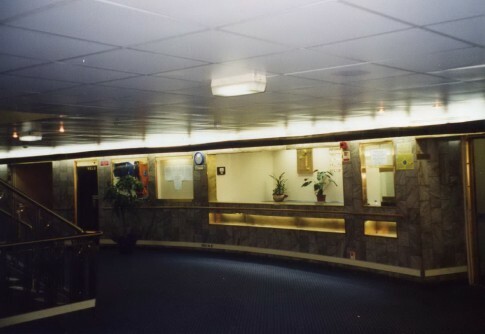 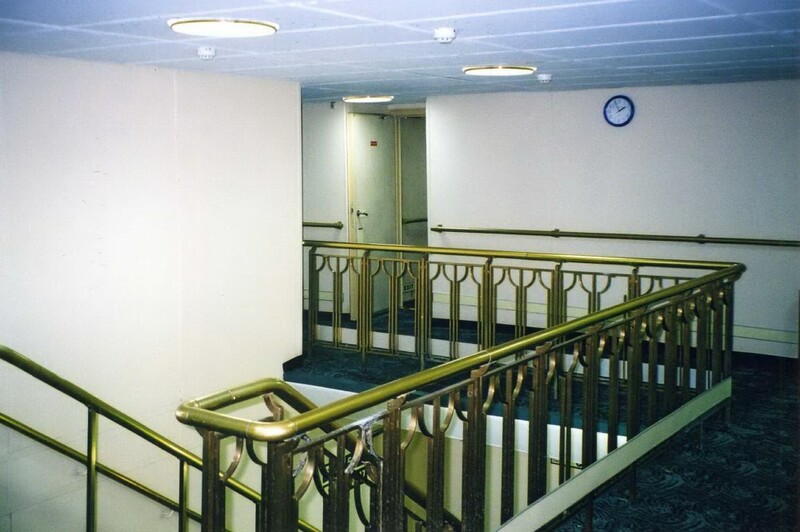 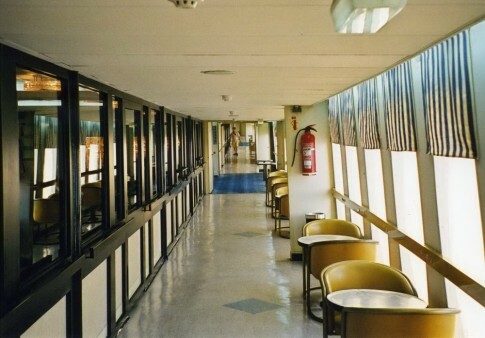 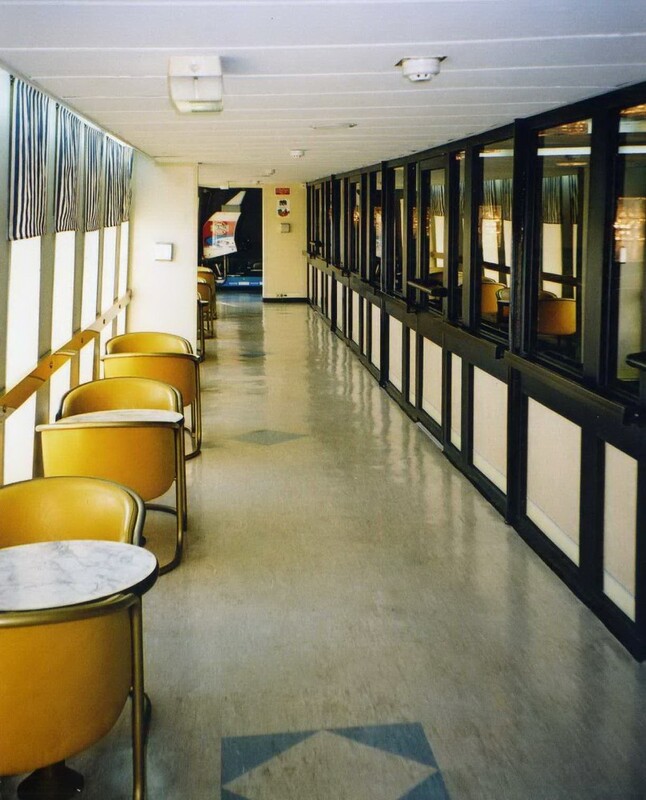 The shared entrance to the Aquarius Restaurant and The Ships Buffet - more theoretically than actually separate, these were installed in the area of the 1981 stretch. The Aquarius Restaurant was named in honour of the company's 1970s cruise ship and was complete with this magnificent builder's model of that vessel. 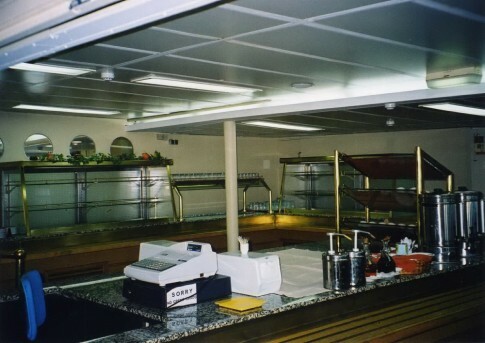 Overall view of The Ships Buffet. 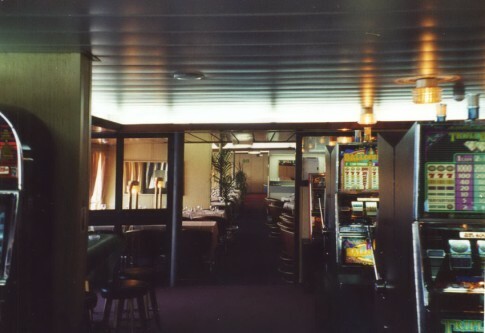 Casino area, just forward of the restaurants on the starboard side. 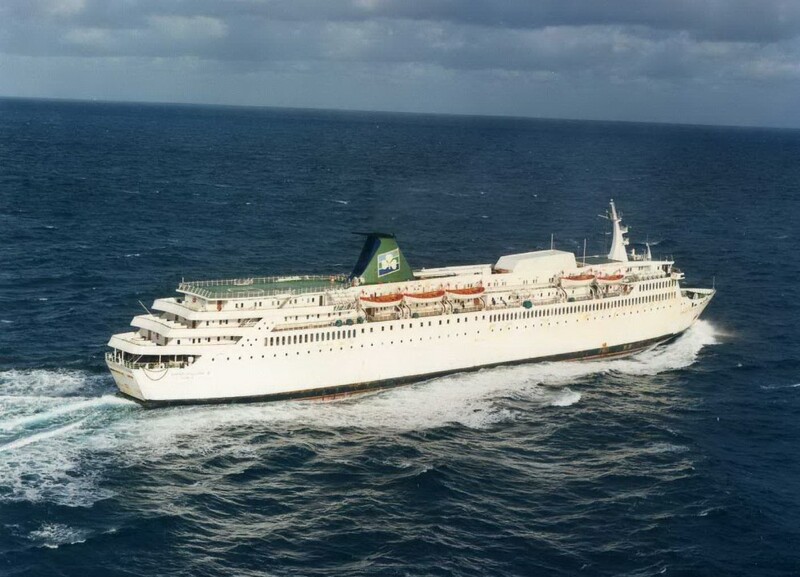 This was nominally called 'The Lydia Casino' after the ex-Koningin Fabiola which operated for HML for a decade from 1985. 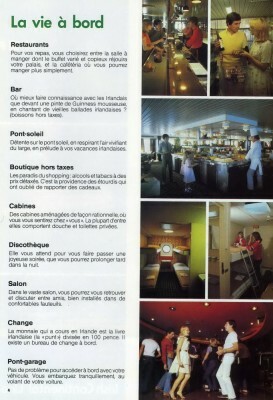 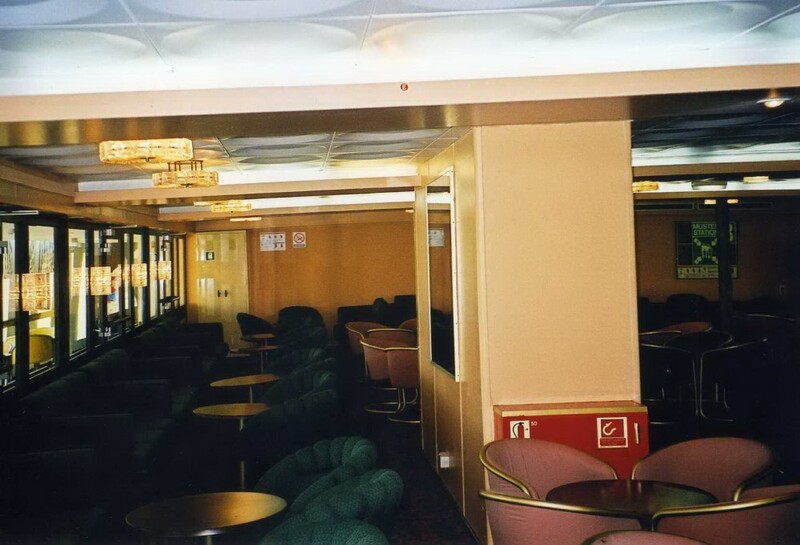 Moving forward again, inboard of the port arcade could be found the Corinthia Lounge. 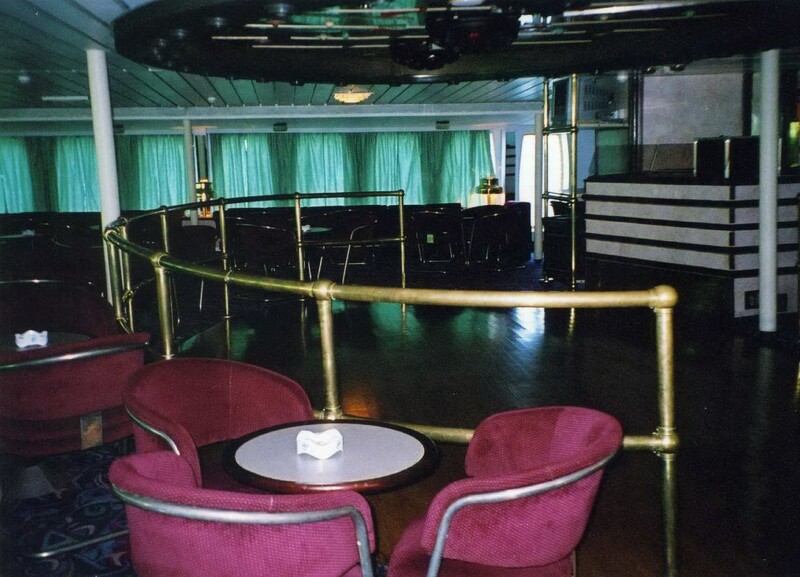 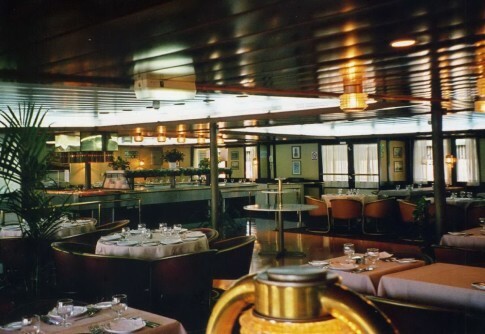 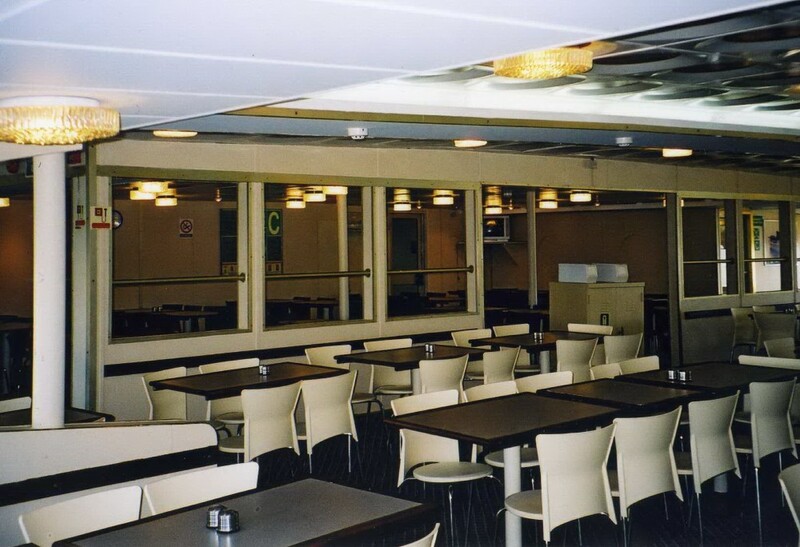 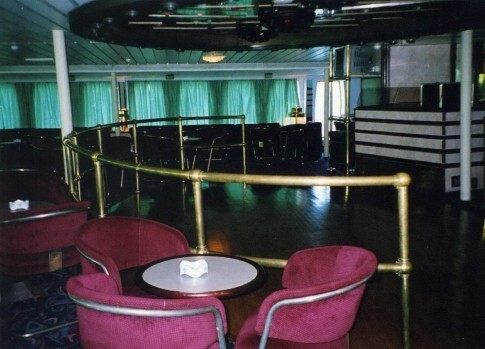 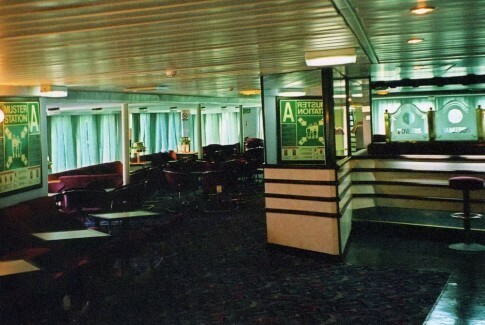 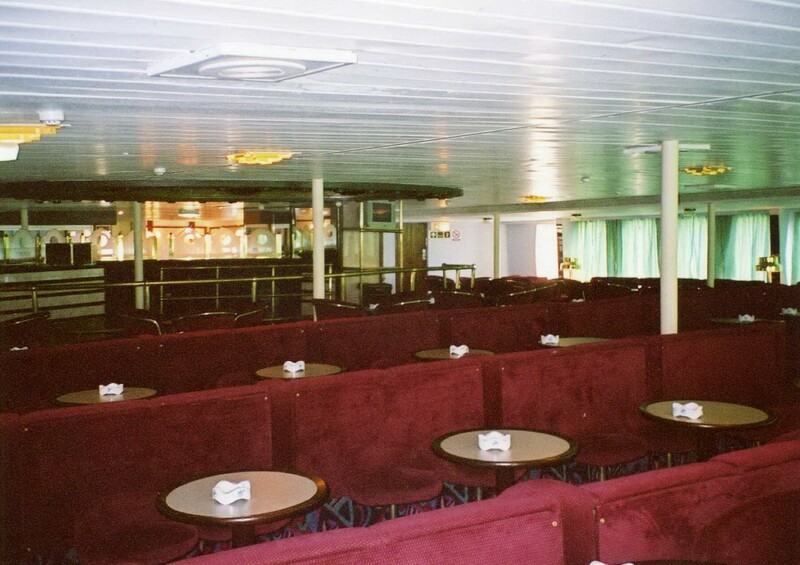 Before the ship was stretched, this area was the main restaurant but in its final guise it was named for the former Sealink Duke of Argyll which sailed as the Corinthia for HML in the 1980s and 1990s. 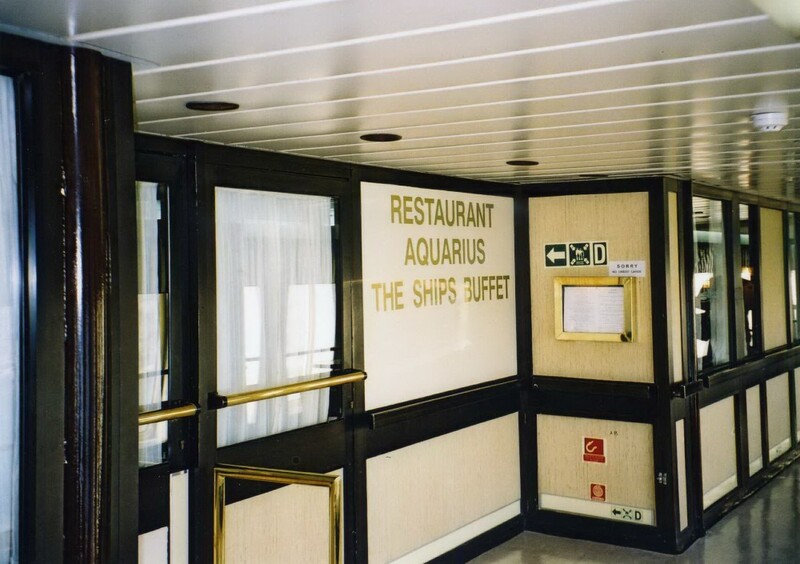 The naming of this area gave the company scope to re-use the bespoke bar menu covers bearing the Corinthia name which had presumably been in storage since her sale in 1994. Another view of the Corinthia Lounge. Right forward was this rather gloomy cinema - the front windows still have their metal rough-weather covers in place to ensure complete darkness. 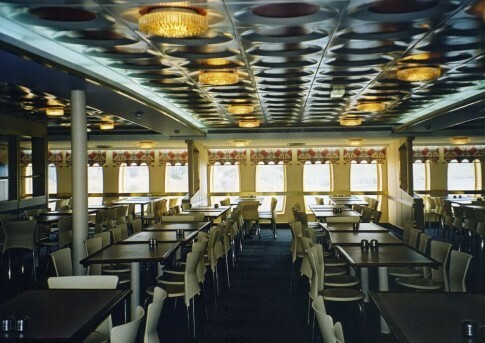 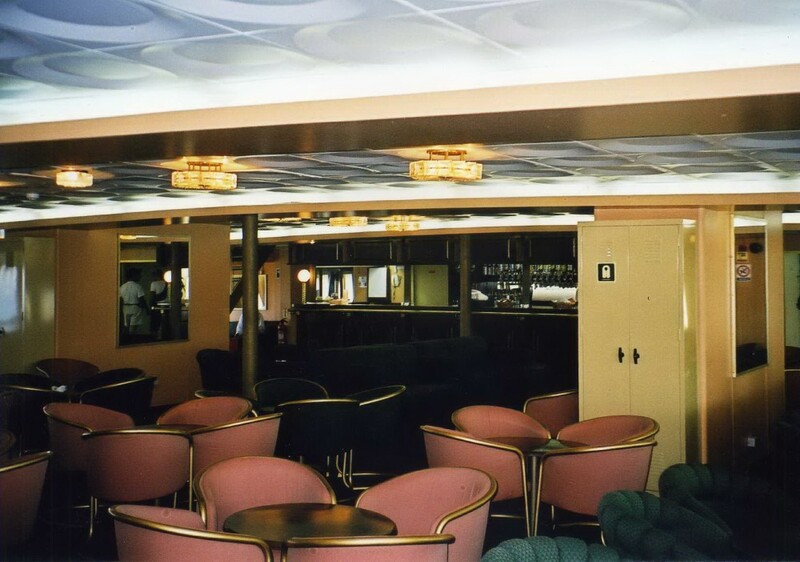 The final main passenger saloon was up on Deck 7 - the main bar, the Ionia Bar, named in honour of the little Hartlepool-built liner which was owned by HML from 1946 to 1964. 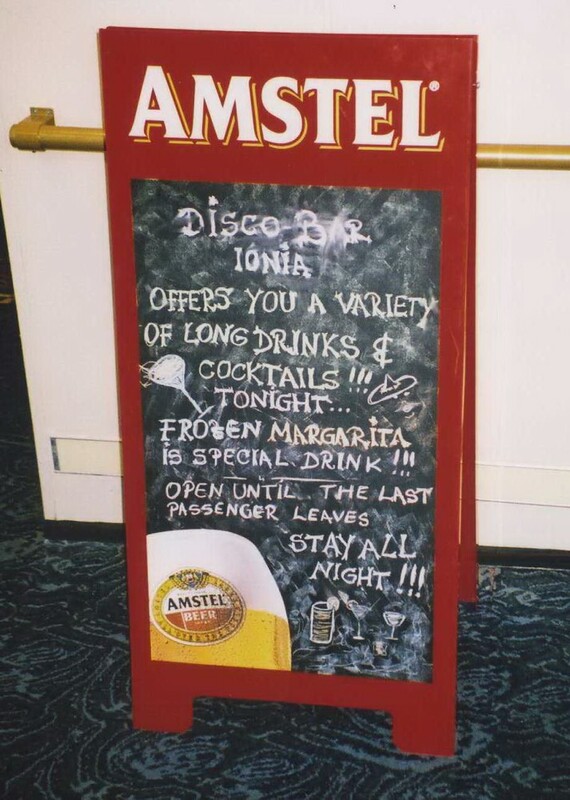 Open until the last passenger leaves. 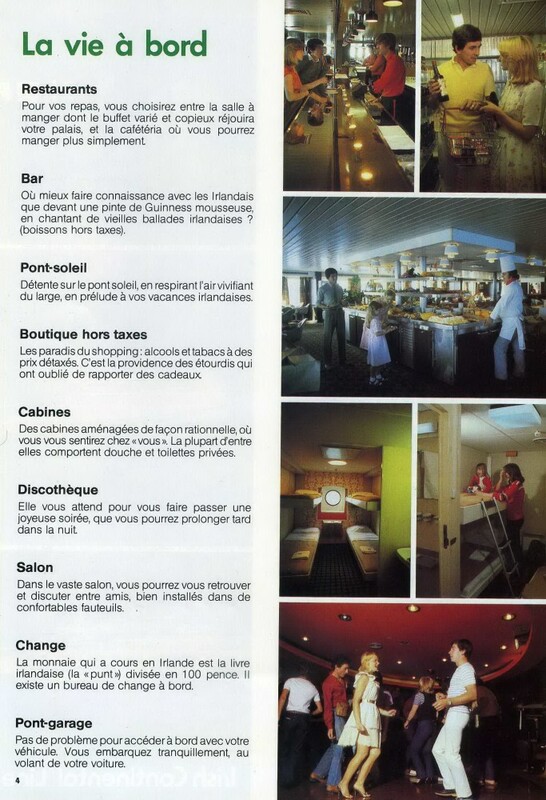 The Ionia Bar had been converted, predictably, into an Irish Pub during the ship's ICL days. 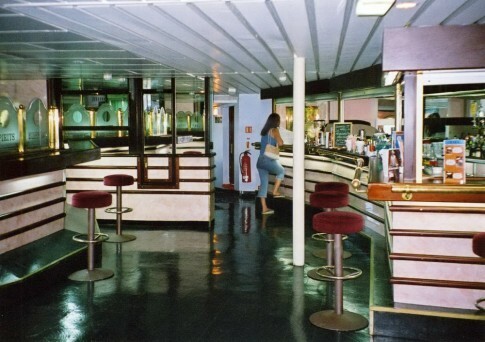 The Ionia Bar, looking forward. 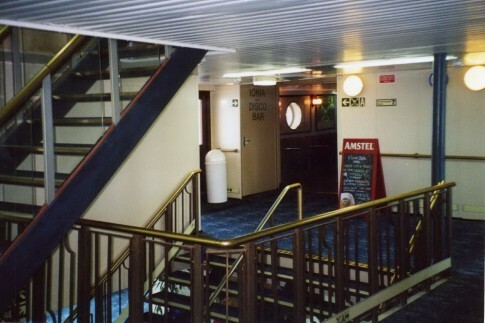 Heading aft into the new Deck 7 cabins added during the lengthening, this is the top of the staircase leading from the main lobby two decks below. The thirteen suites added by ICL on Deck 9 still bore the names of, occasionally obscure, figures in Irish history. 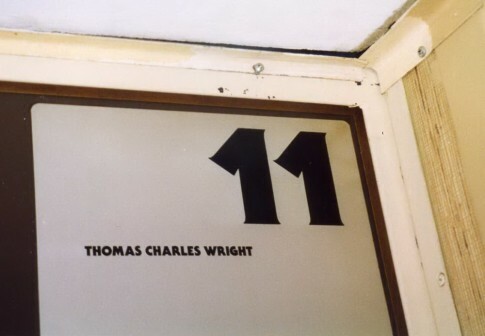 Thomas Charles Wright was an Irish soldier who fought in Latin America with Simon BolÃ­var and, by repute, founded the Ecuadorian Navy. View inside one of the suites. 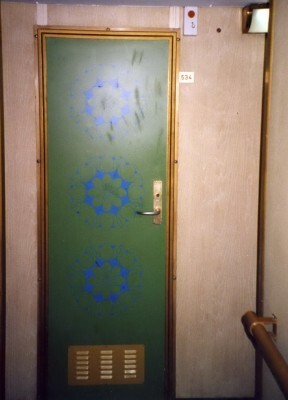 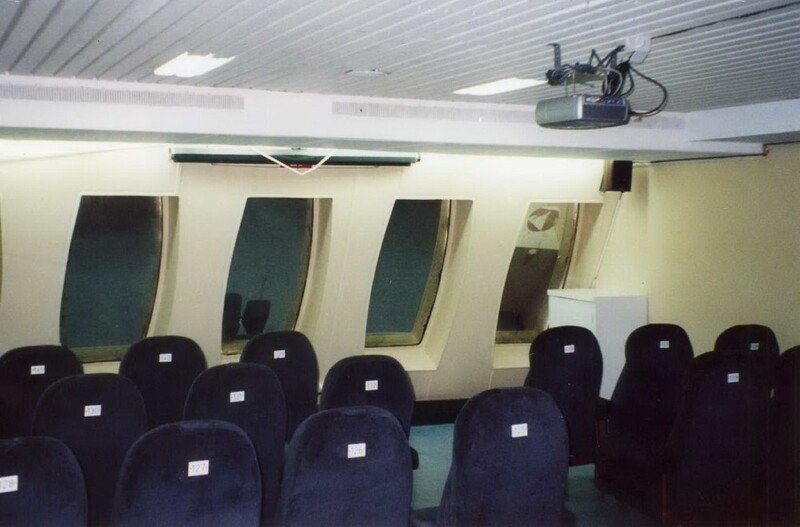 Betraying her '70s roots, most of the Egnatia III's other cabins retained their original doors complete with melamine panels featuring flower prints. 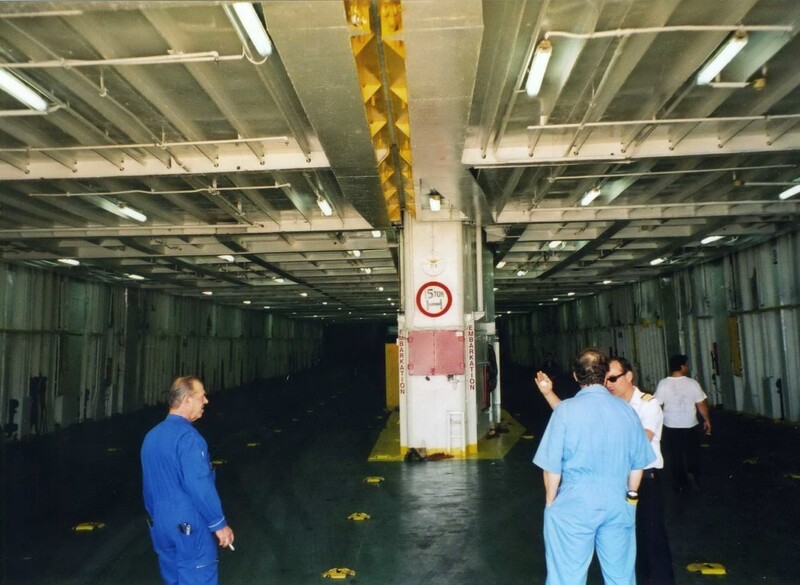 Heading out on deck, and this is the long, teak-planked promenade deck on the starboard side. 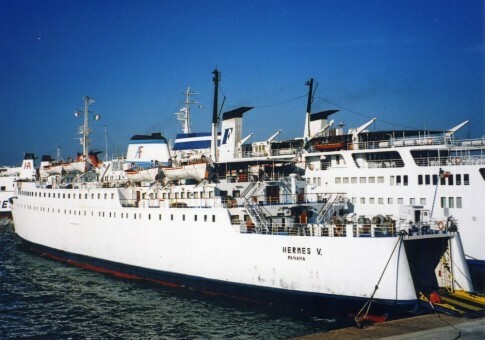 The Hermes V, with the Ouranos and Penelope A beyond. 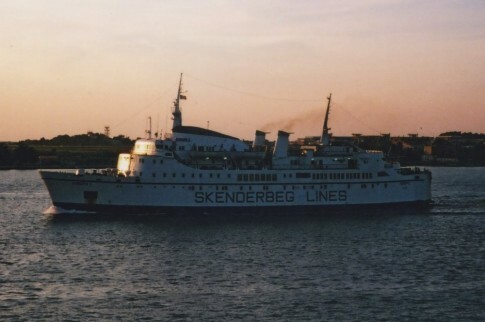 The Penelope A (ex-European Gateway). 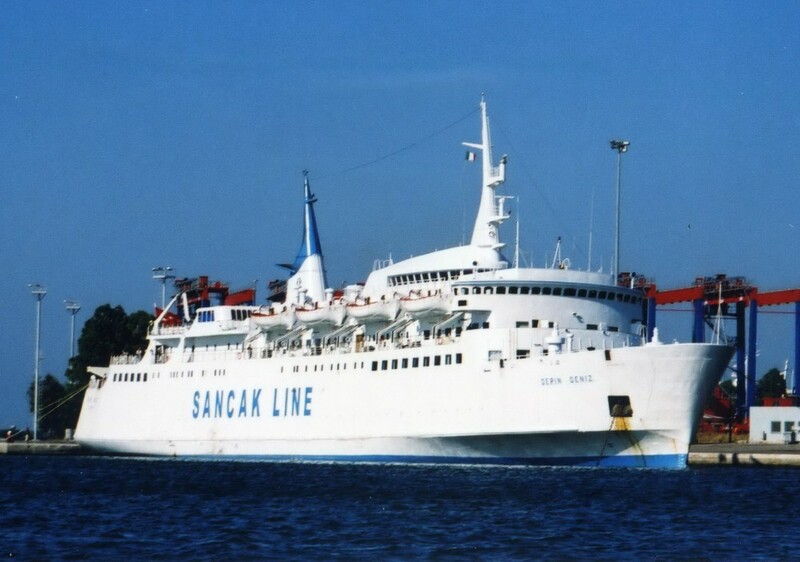 This ship was finally scrapped in 2013. 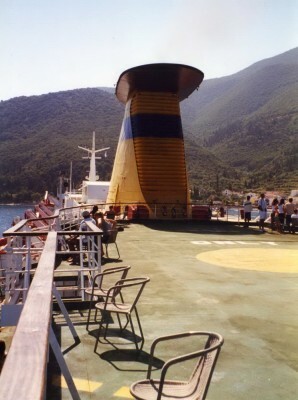 Our ship's funnel, still with the shamrock, painted over but clearly visible from her ICL days. Arriving on her afternoon sailing from Vlore in Albania is the Gabrielle, originally Sessan Line's Prinsessan DÃ©sirÃ©e of 1965. 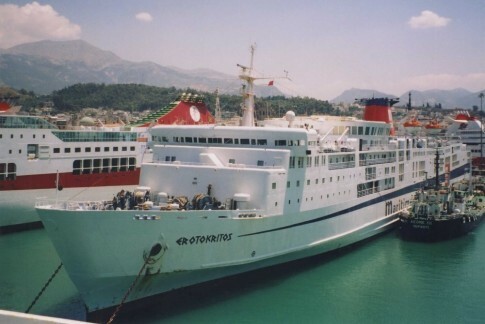 Leaving for Patras is Maritime Way's Erotokritos, a Japanese-built Greek veteran which saw many years of service with Minoan Lines. 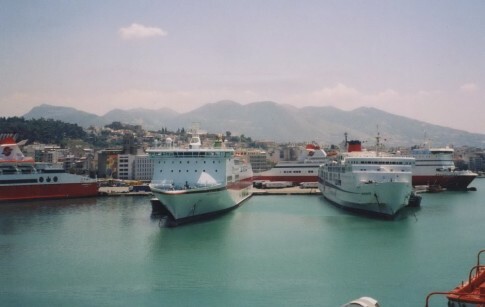 Between her stern and the bow of the Penelope A can be seen the distant shapes of the laid up Tirana (ex-Linda Scarlett) and Jupiter (ex-Surrey). 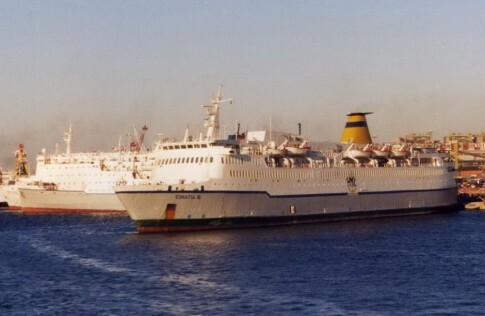 The late arrival of the Europa I (ex-Jens Kofoed), also from Vlore. 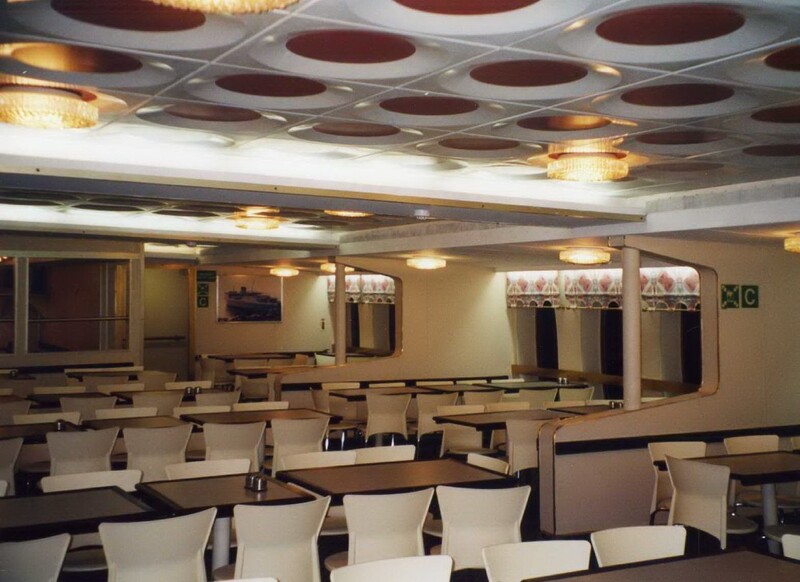 Exploring the dining options that evening, we paid a visit to the self service, where a bowl of HML spaghetti bolognese was served on a Castalia plate and with a fibreglass Aquarius ashtray sitting on the table. The original Dampa ceiling panels are shown to good effect in this view. The self-service was officially called the 'Egnatia Easy Food Cafeteria' and featured this prominent image of the original Egnatia of 1960. The second of the three ships to bear the name was the short-lived Egnatia II which served the company between 1998 and 2000 and was the Saint Killian II's former ICL fleetmate, the Saint Patrick II. 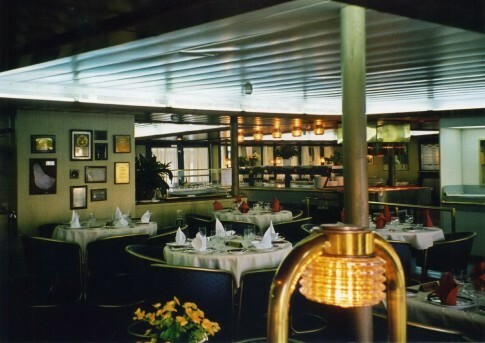 The Ships Buffet at night. 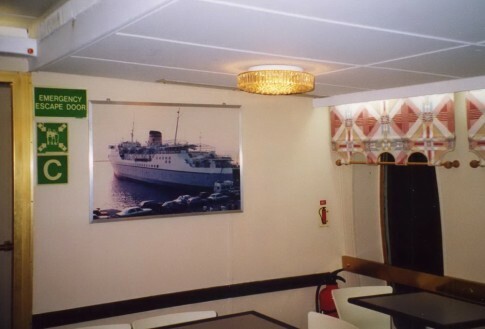 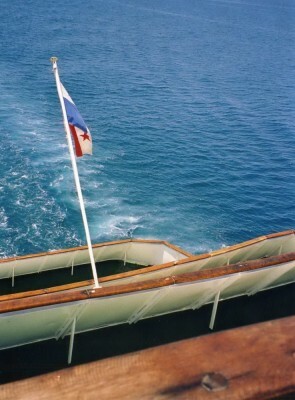 The pictured vessel on the central bulkhead is one of the ex-Swedish Lloyd pair, the Britannia and Suecia of 1929 which served HML as the Cynthia and Isthmia in the late 1960s on long routes from Marseille to Port Said and Beirut. 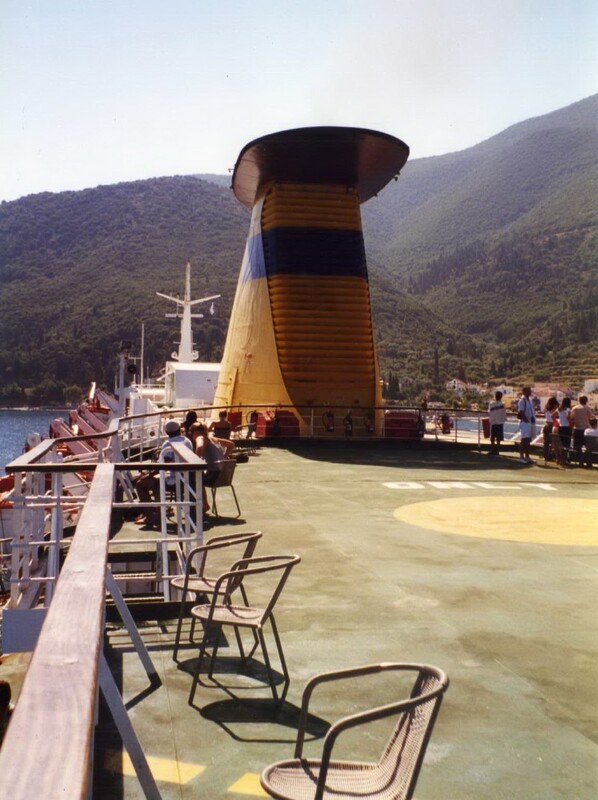 The following morning, having already called at Igoumenitsa, found us motoring south towards Kefalonia. 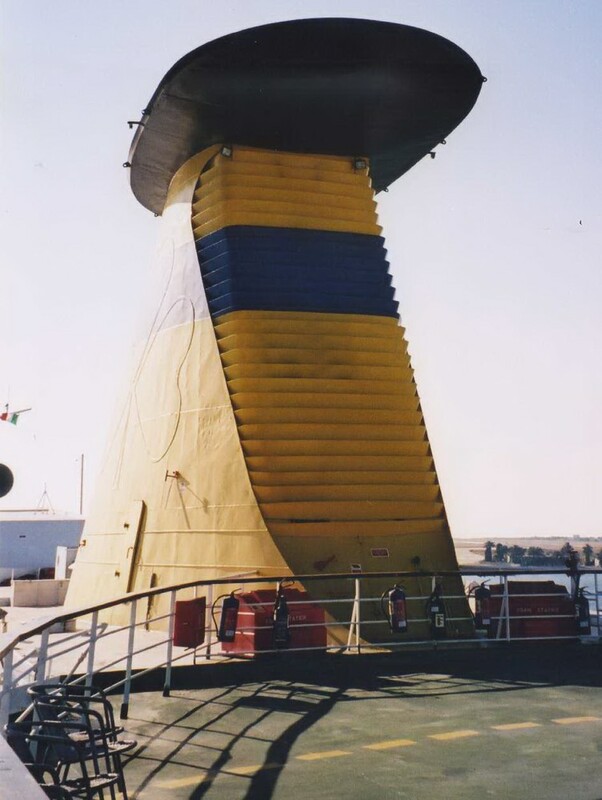 A stern view showing the tiered sun decks. 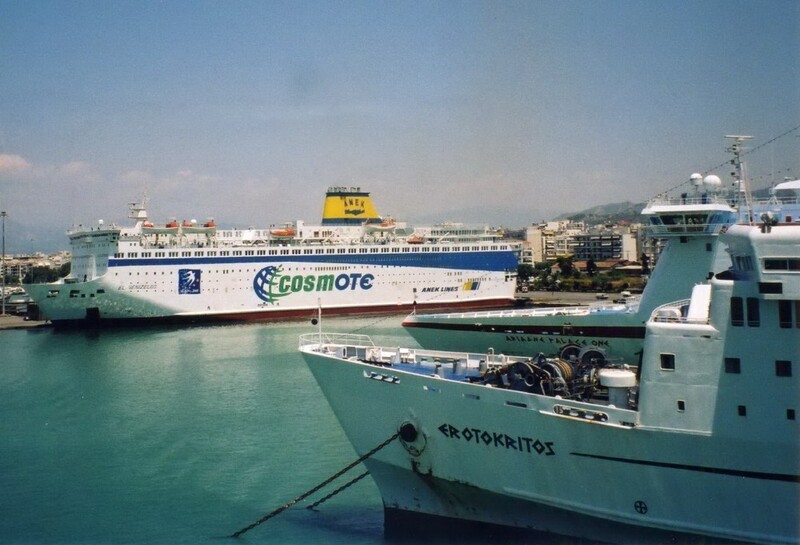 A first, distant, view of our final destination, Patras. 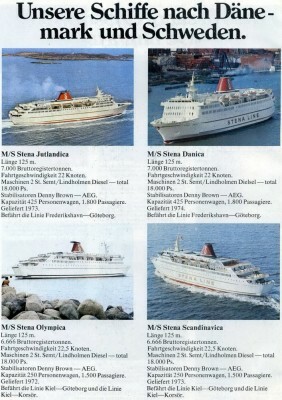 Seven ships were already in port - unlike in Brindisi, only one of these does not survive today. Superfast XII, Ariadne Palace One (today the Mega Express Three), Erotokritos and Superfast I (today the Skania). The Erotokritos served out her career with Endeavor Lines, still sailing from Brindisi until being sold for scrap in 2010. ANEK's El Venizelos in Cosmote advertising livery. 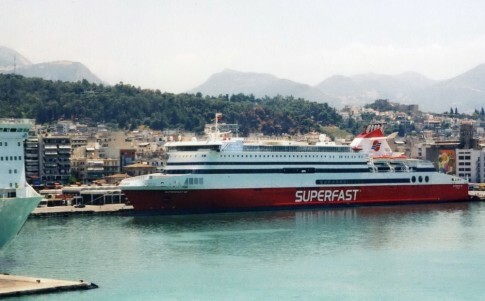 The Superfast I with the Superfast XII in the background. 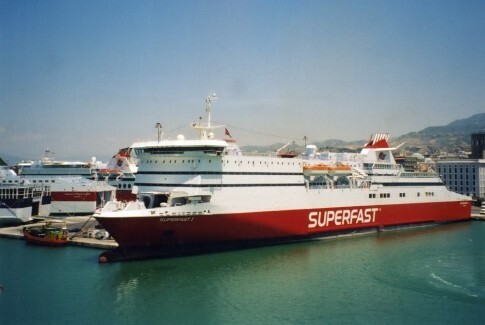 The first and last of Superfast's twelve original ships served together for just fifteen months. 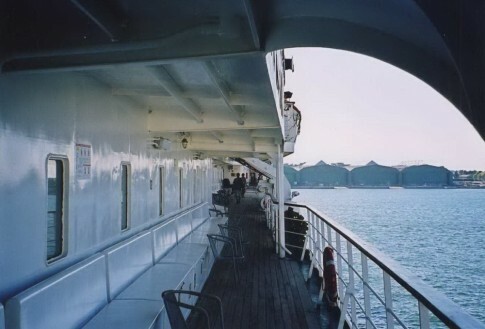 Following us into port was the Europa Palace, which today operates for Tirrenia as the Amiscora. Berthing adjacent to the Ikarus Palace.